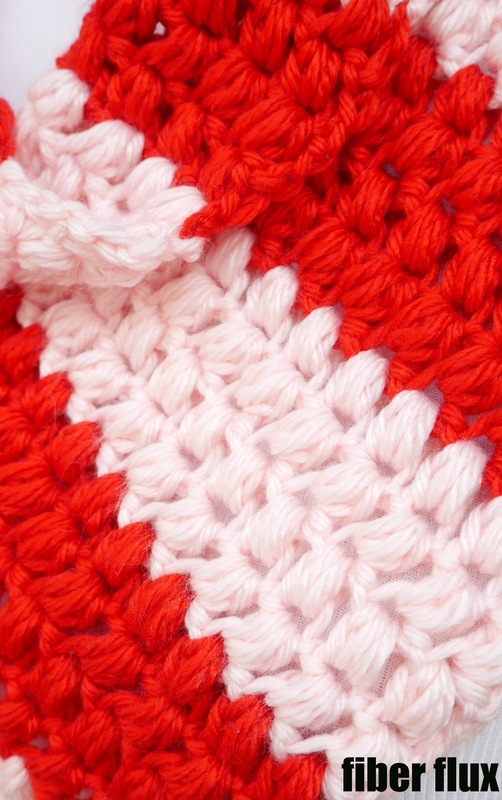 Fiber Flux: Free Crochet Pattern...Peppermint Pop Button Cowl! Free Crochet Pattern...Peppermint Pop Button Cowl! Get Mighty Stitch yarn here! I worked 4 rows of each color before switching. Row 1: In the fourth ch from the hook, work a puff stitch, then ch 1. *Skip 1 ch and in the next ch, work a puff stitch. Repeat from * until you have two ch left on the hook. Skip the second to last ch and in the last ch, work 1 dc. Row 2: Chain three and turn. Work a (puff stitch, ch 1) in the top stitch of each puff from previous row. Work a dc in the top stitch of the turning ch. Repeat row 2 until cowl measures 28 inches long or desired length. Without fastening off, chain 12 (you may need to work more or less depending on the size of your button), then work a slip stitch into the stitch at the base of the chain to create a loop. Fasten off and weave in ends. To create a button cowl, sew a button onto one of the corners of the rectangle. You may need to try it on for exact placement before sewing. To make a traditional cowl, simply seam the ends together.